This short guide is intended to help you install GPS equipment for timing purposes. The Global Positioning System, GPS, is based on a network of satellites. These satellites are not in geostationary orbit, so viewed from the Earth they rise, move across the sky, and set. Each satellite has a different orbit, and reaches a different height above the horizon (elevation) before it begins to set. 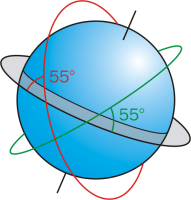 The orbits are inclined at 55 degrees to the equator. The GPS receiver receives signals from all the satellites it can see , i.e. which lie in an unobstructed region of the sky. For the digitiser to be able to synchronize to GPS time, the receiver must be able to see at least three satellites. The less sky is visible from the position of the receiver, the fewer satellites is it likely to receive. Satellites which only reach low elevations are especially likely to be blocked by objects on the horizon. A receiver placed on the ground in a reasonably built up area may only be able to see the sky at high elevations—as much as 50 degrees from the horizon. In this situation, only satellites which pass nearly overhead can be used by the receiver. Because the GPS satellites spend most of the time near the equator, if you are in the Northern Hemisphere, more satellites will appear in the southern sky than in the northern sky. Likewise, GPS satellites appear mainly in the northern sky of sites in the Southern Hemisphere. The higher the latitude of the installation, the more pronounced this effect becomes. At latitudes higher than 55 ° N, no GPS satellites ever appear in the northern half of the sky. A good rule of thumb is to install a GPS receiver in a place which has a good view of the sky, and which gets a lot of sun throughout the year. The sun varies from −23 ° to +23 ° in latitude, similar to most GPS satellites. In the UK, the south side of a building will get much better GPS signals than the north. A receiver on the roof is preferable to either. You can test GPS reception in a particular place using a handheld GPS unit. However, handheld GPS units are often optimistic about the reception, as manufacturers compete to show their devices receiving the best signal. 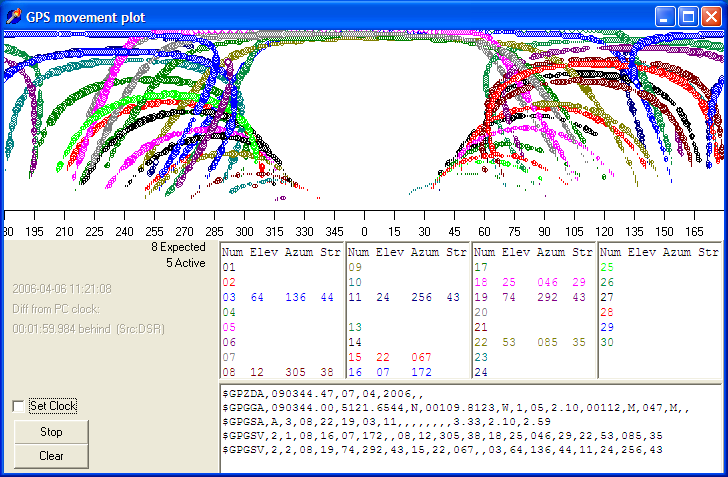 They are not optimised for timing, which requires a view of multiple satellites. Because of this, a handheld GPS unit may show a good signal in places where a GPS used for timing will have problems. This plot shows the traces of GPS satellites across the sky over a 18-hour period, viewed from our factory in Aldermaston. There is a large region of the northern sky (around 0 °, centre) where no GPS satellites pass. As satellites approach the horizon, their signals become fainter. We can also see that the eastern horizon (to the right) is more obstructed than the western horizon. Overall, however, the placement of this receiver is satisfactory, since 5 satellites are visible at most times. Monitoring GPS performance in Scream! Guralp Systems digitisers output GPS information in status streams. When Scream! receives a status message, it extracts the GPS information, and uses it to colour the top half of the digitiser’s icon in the main window. If both halves of the icon are clear , Scream! has not received any information from the instrument since the program started. If the top half is red , the digitiser has not reported a satisfactory timing fix for over an hour. This will happen if the instrument has reported failures (as above), but also if it has not reported anything. If you have set the GPS system to power down for intervals longer than an hour, the icon will turn red even if the system is working normally. Scream! has not received any information from the instrument since the program started. 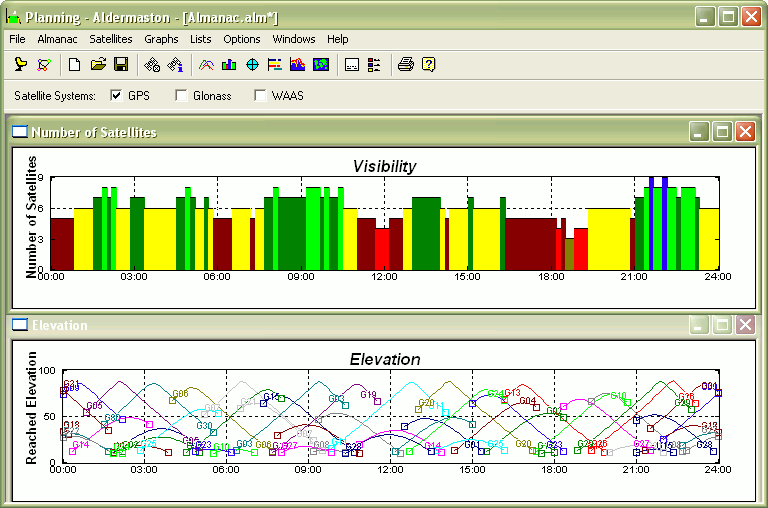 The same colours are used for the GPS column in Scream’s Summary window. You can also read the status blocks directly by double-clicking on the status stream coming from the digitiser. Status streams always end in 00, and have a displayed sample rate of 0 samples/s. The message GPS control OFF denotes that the clock is not yet being controlled by the GPS. Because the operators of the system inject noise purposely into the GPS timing stream, and because of signal travel time issues, the GPS time cannot be directly used to synchronize the clock. Instead, the digitiser maintains a rolling average of time measurements, and uses this to apply corrections to the clock so that it remains accurate over a long period. In this case, a fix cannot be obtained because only 2 satellites ( SV s) are visible: numbers 4 and 20. If you get a SV#'s none message, the GPS receiver cannot see any satellites at all. In this case, the digitiser cannot see two of the satellites it expects to find, but the remaining satellites have a good enough signal to obtain a fix. Scream can alert operators by e-mail if the digitiser loses its timing fix. Open the EMail tab of Scream!’s Setup window. Enter the IP address or hostname of your outgoing mail server in the SMTP Server box. Enter the e-mail address you want to send to in the Recipient box. Check the GPS Control Timeout box, and the boxes for any other events you need alerts for. Scream will now send an e-mail whenever the GPS control system fails to report anything for 12 hours.